Yoga helps transform your body, your life and your outlook. Lara Alexiou founded Steamtown Yoga in 2007. We teach awareness, mindfulness, and zen living to the modern individual through our Hot Yoga classes, Meditations, Workshops and International Retreats. Live every day, stress-free, pain-free, steeped in creativity and connected to your highest purpose. Lara formally trained and certified with Bikram, Jimmy Barkan, and Zen Wellness in Yoga and Qigong. She personally trains and certifies each teacher at Steamtown Yoga through a 200 hour program that exceeds the standards set by Yoga Alliance. Note: SHY Instructor Certifications are recognized by Yoga Alliance, National Qi Gong Association, and United Martial Arts Associations. 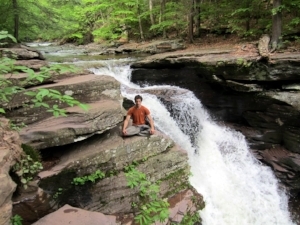 In 2007, Lara opened the doors to Steamtown Yoga bringing the healing transformation of Hot Yoga to NEPA. Steamtown Yoga is the first Hot Studio to open in NEPA and one of the first Yoga studios to open in the greater Scranton area. 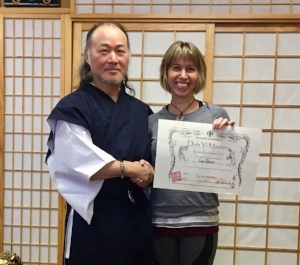 Lara with Grandmaster Sung Baek receiving her 10,000 Doh Yi Training Certificate in Dec. 2017. 2018 Lara’s book Become the Architect of Your Body, Mind, and Soul was a featured item in the Yogi Surprise Spring Equinox Box. 2017 Lara completed the 1000 Hour course requirements recognized by the National Qigong Association to become a Zen Wellness Medical Qi Gong Director. 2017 Lara was awarded the "Doh Yi Masters Certificate" recognizing the completion of 10,000 hours in Qi Gong Training. 2017 featured workshop presenter for the National Qigong Association Annual Conference with her workshop: The Tao of Meditation with 5 Element Qigong Music. 2017 Presenter at the NEPA Yoga Fest. 2014 Presented her TEDx Talk: Architecture of the Body, Mind, and Soul. 2012-Present Lara is a Certified Business Mentor with Zen Business Mastery and teaches Yoga Studio Business Strategy for the Spiritual Entrepreneur. Lara has been a webinar presenter for Yoga Alliance on multiple occasions. Lara studied Ayurveda through the Himalayan Institute. Yanni has been a practitioner for more than 30 years. Yanni out for a stroll above the watter. “What you believe, you become.” I’m a true believer that we can do anything we put our minds too. With time and effort, there is little outside our grasp. The practice hall's FIR radiant heating system does not make any noise, complimenting our tranquil environment. It also uses only one tenth the energy of a forced air system. A energy recovery ventilator coupled with a UV filtration systems change the air in the studio recovering at least 87% of the room's heat further contributing to the studios efficiency. The studio offers filtered water in addition to recycling bins throughout the space. Bring a reusable water bottle! In 2014 Lara was a featured speaker at Scranton’s first official TED Talk forum, TEDx Scranton. Her talk, Architecture of the Body, Mind and Spirit, focused on her personal journey of healing through Yoga, and how Yoga can help others. Watch Lara’s Powerful and Moving Tedx Talk here. The Chinese character represents TAO. Tao in Chinese philosophy is the absolute principle underlying the universe, also translated as the “ Way” or “Path”. To live according to Tao is to live in harmony with the laws of nature and the universe. Here at SHY we want you to find your path to inner and outer harmony. We chose the Tao for our logo because it represent our dedication to helping you find your highest connection to your physical, mental and emotional "way". Want to see what our space looks like? Take a virtual tour!